So we went down to put the seaweed on the asparagus on Saturday, and found this. After such a cold winter, I was expecting that it might be up later than last year, but in fact it seems to be earlier by a week, and a few days earlier than the year before. The last couple of weeks of fine weather must have done the trick. The birds too seem to be slightly manic. Early evening, when it's pretty much empty of people, and just before the sun goes down, the plots are alive with birds flitting, flapping or whistling. It's as if the end of the hard winter has made them desperate to get on with the process of procreation. Closer to home, we've heard the sound of a green woodpecker in the mornings, possibly in an old ash tree in the large garden that backs onto our street. And on the Regent's Canal, we watched a pair of coots feeding their newly hatched brood of dark downy cootlings; by Saturday they were venturing further away from the nest. I doubt whether the dinner-pate sized turtle/terrapin slinking on a nearby log was entirely benevolent. Many thanks for comments on cameras. My sister-in-law kindly let me borrow her Cannon Ixus 130. Neat, but not quite as easy to manipulate as my old Fuji Finepix. Can I be the only person in the world overwhelmed by choice? How great that the "sparrow grass" has come through already! Alan is out every day looking at our patch, but so far nothing. However my globe artichokes have reared their pretty heads, much to my delight as I was sure that the extreme cold up here in this winter had done for them. Isn't nature amazing! Yes , after a very late start , everything that can bloom , shoot or tuft is suddenly doing it ..... and the birds are busy doing their birdy thing madly , too . Your asparugus inspires deep envy ! I'm a bit late with camera recommendations , but I love my cheapo Canon PowerShot A495 . I like the depth of colour a Canon gets . Wow, first coot chicks seem very early too! I keep looking each time I go past the pond on the way to work, but no chicks yet. My asparagus came up early - weeks ago but got stuck. It's not green, not interesting, not grown. 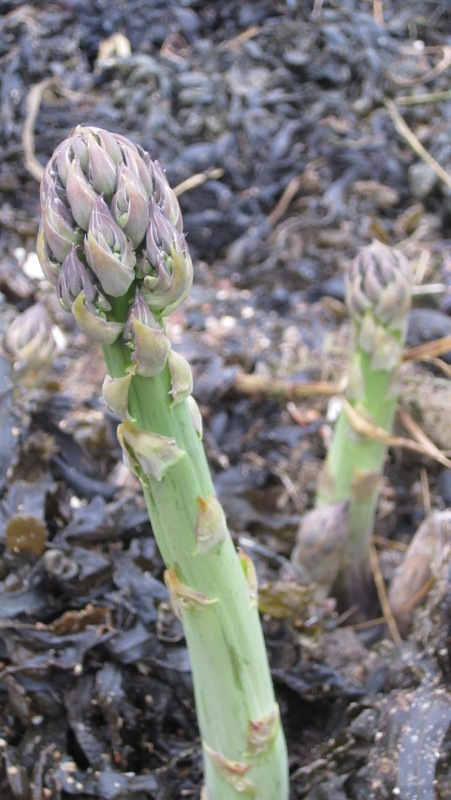 I lurve asparagus... just planted my strawberries in the hope of a crop. Have tried before but the dog always eats them. Ooh, that looks promising. I've never attemtped to grow asparagus but have a rhubarb crown to go in when I remember.